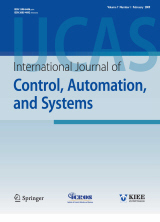 Abstract : "This paper studies the output feedback controller design problem for a class of interconnected systems with uncertain interconnections. First, the interval observers are built to guarantee the interval property between the system states and their estimations. Then, the state feedback controller is designed for each observer system other than output feedback controller for original system. A cyclic-small-gain condition is used to deal with the bound functions of the uncertain interconnections. The original closed-loop system is robust stable since that the interval properties are satisfied. The non-convex conditions caused by traditional observer-based output feedback are avoided by transforming the output to state feedback problem. Finally, the main results are demonstrated by numerical simulations." Keyword : Cyclic-small-gain condition, interconnected systems, interval observer, output feedback control.